In this web page,"adding integers with different signs" we are going to see how to simplify two numbers with different signs. Add both numbers and put "big number" sign for the answer. 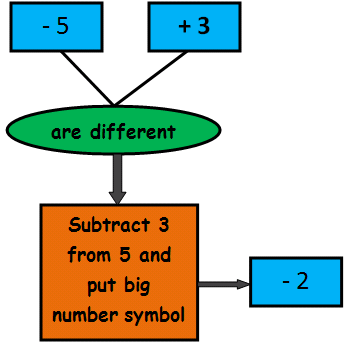 Subtract small number from large number and put "large number" sign for the answer. The above rule is applicable for simplifying any two or more integers,fractions and decimals. 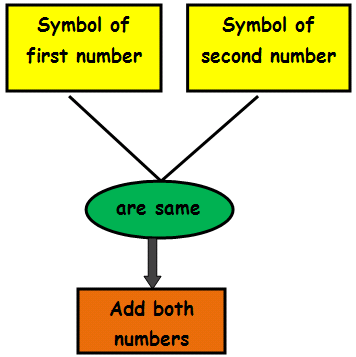 This flowchart will explain you how to handle two numbers with different symbol. 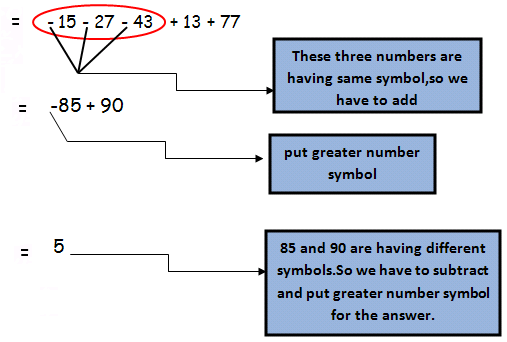 how do you find the sign of answer,when adding integers with different signs? Note: Always we have to put big number symbol for answer. What we have to check? Consider the symbol of two numbers. The symbol of first number is negative and the symbol of second number is positive. Do we have to add or subtract? 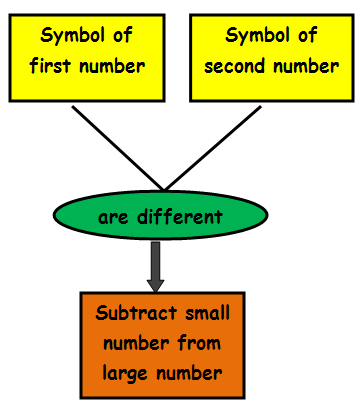 Since the symbols of both numbers are different we have to subtract small number from large number.Here small number is 3 and large number is 5. By subtraction we will get 2. What symbol we have to put for answer? We have to put symbol of big number. Here the big number is 5 and we have negative symbol for this. -5 + 3 = -2 is the answer. We have explained this concept in the below flowchart. We get profit from two different business.To find total profit we have to add. We get loss from two different business.To find total loss we have to add. We get profit from one business and loss from other business.To find how much we lost we have to subtract. We get loss from one business and profit from other business.To find how much we lost we have to subtract.